A new exhibition in Johannesburg – Re-membering: Memory, Intimacy, Archive – includes provocative works by Jordache A. Ellapen that “queer” the Indian experience in South Africa. 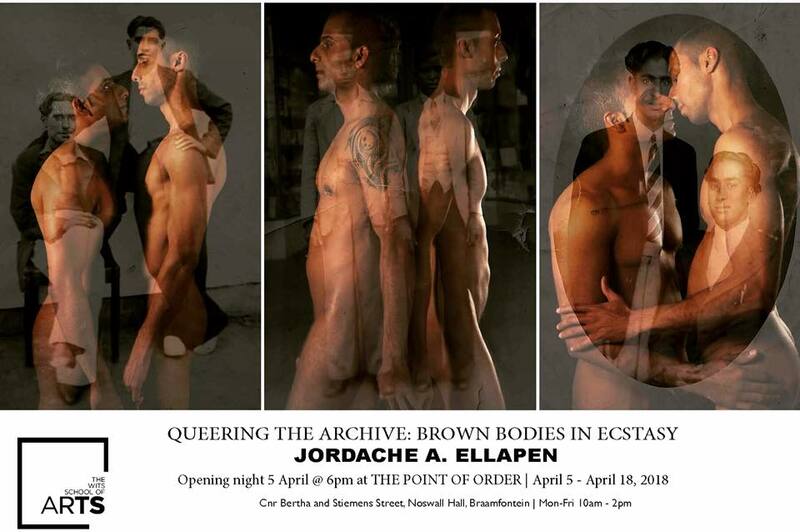 Ellapen’s photography project Queering the Archive: Brown Bodies in Ecstasy examines the intersections of race, sexuality, and eroticism as they relate to the in/visibility of black and brown queer bodies and subjectivities in South Africa. Through the photographic image, he disrupts the notion of discrete racial formations in South Africa by emphasizing the entanglements of history, memory, race, diaspora, and desire in the very constitution of racial categories. In his art, he responds to the near absence of visual representations of brown queer subjects in the public sphere. When the Indian emerges in visual representations, the focus is either on Mahatma Gandhi, anti-apartheid politics, or stereotypes of the middle-class Indian as the exploitative merchant. Such representations reproduce a heteronormative and homogenous perspective of the Indian experience, one that renders class stratification and gender and sexual difference invisible. Such representations also offer a limited perspective on Afro-Indian relations in South Africa that over-emphasizes heteromasculinist tropes. His work centers alternative identities and experiences by focusing on the queer of color subject. He turns to aesthetics and eroticism to disrupt the heteropatriarchal gaze and its violence against (queer) bodies of color. The exhibition runs till 18 April at The Point of Order at Wits.